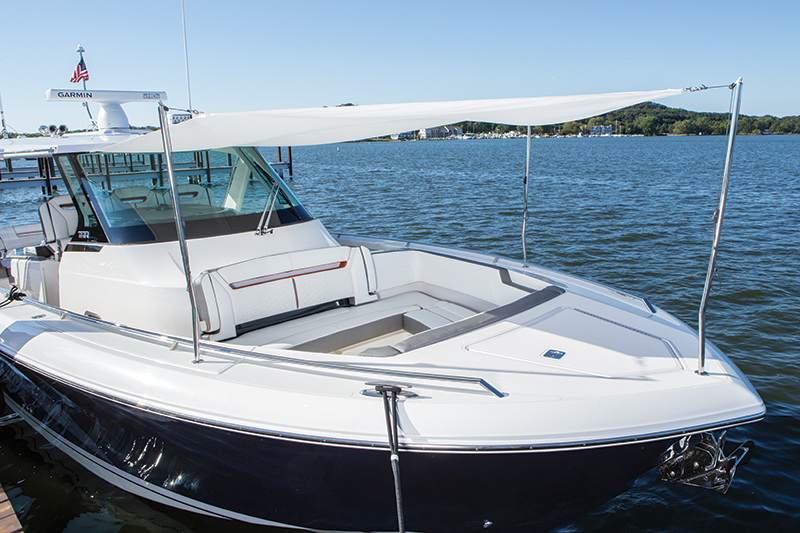 The builder's new outboard model is a center console dayboat that can reach almost 60 mph. At 58 mph, with its triple Yamaha F350 outboards growling and spinning at just shy of 6000 rpm, our test boat skipped atop the mostly calm surface of the Pacific Ocean off the coast of Newport Beach. Only the aft half of the hull was in the water as we flew along — I know because Silver Seas Yachts’ Ben Masonheimer had a drone in the air — and before I knew it we were several miles down the coast. Such was my experience aboard the Tiara Sport 38 LS. 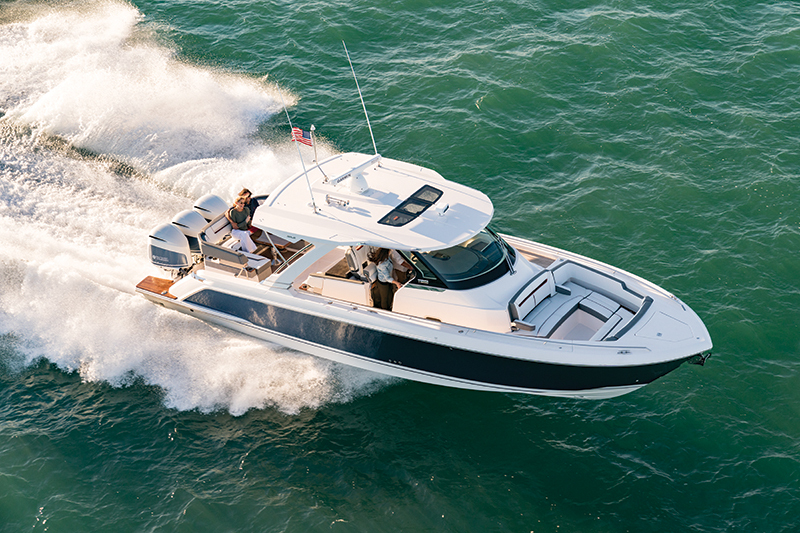 Tiara Sport is a recent addition to the Tiara Yachts family and includes the 38 LS we tested and two smaller 34-foot siblings, an LS and LX (more of an express model). The builder is looking to add some luxury to sport yachting, and it’s using outboard power — Yamaha exclusively — to deliver sporty and exhilarating performance, which, I would venture to say, 58 mph qualifies as. Masonheimer and I pulled tight turns and figure 8s at 50-plus mph, and the 38 LS handled them with a very controlled sportboat lean that tightened the diameter of the circle without bleeding off a ton of speed. Many times it’s nice to have some wave action with some chop during a sea trial, to see how a boat handles such conditions, but a fairly flat day with only a bit of wind chop was just what the editor ordered for a test of a boat with this kind of speed. We were able to pin the throttles and go full speed to really get a feel for the boat. A nice choppy roll would have been nice for testing the Seakeeper gyro stabilizer, but I’ve been on many boats with a Seakeeper, and the gyro always eliminates the roll. At the aforementioned 58 mph, the triple Yamahas were burning a combined 100 gph, which puts the boat’s range at 174 miles (with a 10 percent reserve). Its most efficient speed was at 4000 rpm and 35 mph, where fuel burn was 40.9 gph, for a range of 280 miles. A good faster cruise would be at 4500 rpm and 40.4 mph, which yielded a 49.9 gph fuel burn and a 242-mile range. 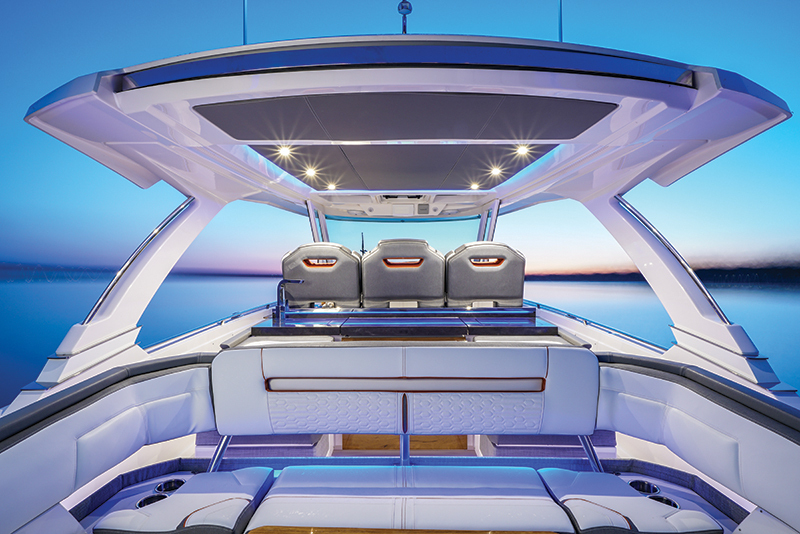 While performance is definitely an attribute the 38 LS can brag about, its real strength is in the dayboating sphere, where the center console design boasts two comfortable social areas, one of which has a hidden surprise. In the bow, which is accessible via sidedecks to either side — the walkway to port is raised forward of the helm to accommodate the cabin below — U-shaped seating creates a cozy spot for six people, with a forward-facing bench forward of the console, an aft-facing seat far forward and another bench to port. Cupholders abound and speakers bring the party. Using hooks under the hardtop and three stowable poles set into gunwale rod holders, owners can install a Bimini that covers the bow seating arrangement. At the aft end, a C-shaped settee at the transom wraps around a table to create a dining/cocktail space. 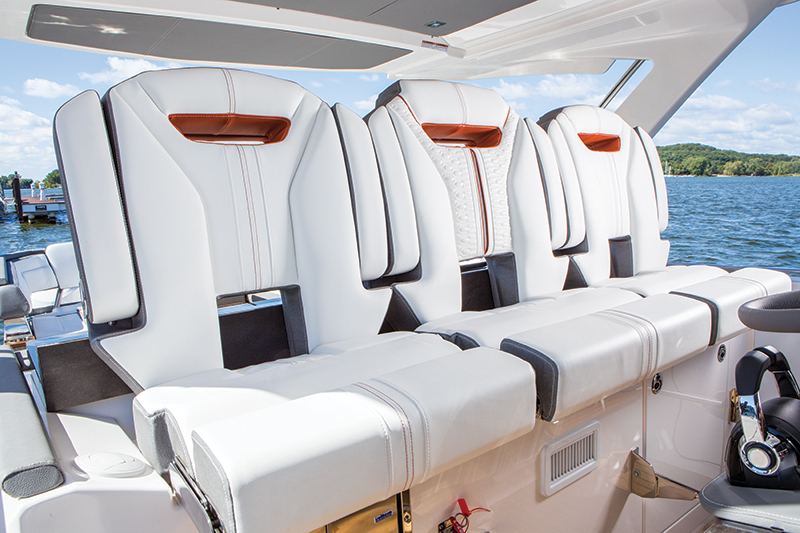 Two seats built into the galley console — the same console serves as the base for the triple helm seats — face aft and give the area a conversation pit feel when combined with the settee. This is where things get interesting. Lifting a stainless steel latch unlocks the entire settee island and allows one person to spin it 180 degrees, turning it into an aft-facing viewing platform. It’s a neat touch that is sure to get plenty of use during harbor cruises and dockside cocktail parties. 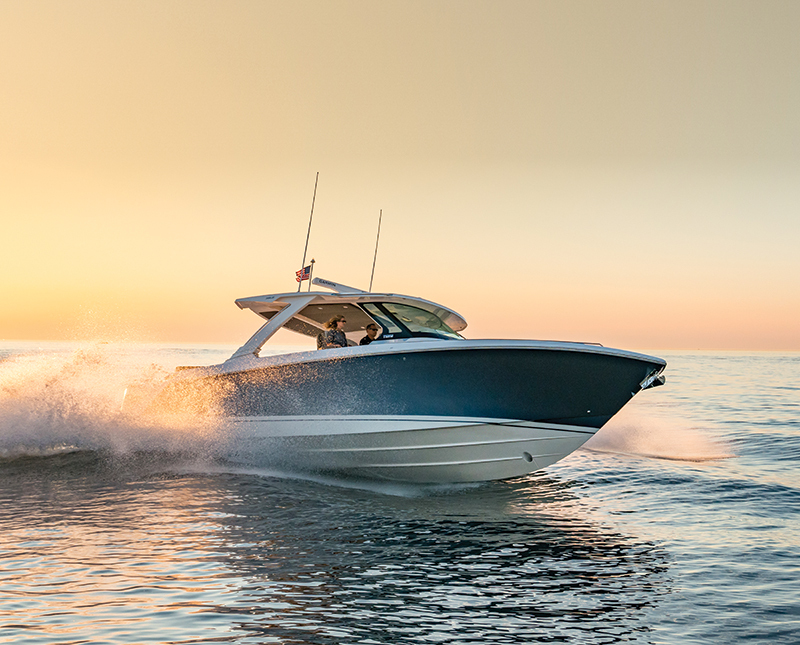 Seeing as how there is no “transom” when the seat is turned — nothing stands between its occupants and the outboards and the open water — spinning it is not a great option for at-speed seating. 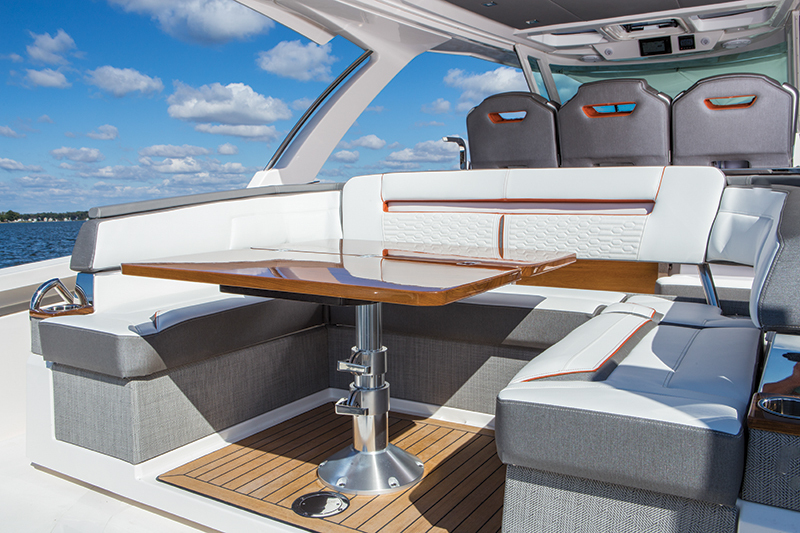 A sink and a grill, which is hidden under a Corian top, are built into the galley console, which stretches the width of the center console itself. An all-purpose drawer and a drawer-style refrigerator are below the console top, between the built-in rear-facing seats. An ice-maker is built in under the starboard helm seat. Tiara’s work with larger models, and electronics manufacturers’ advancements in bringing large-yacht tech to smaller yachts, means the 38 LS’s helm is both elegant and highly functional. 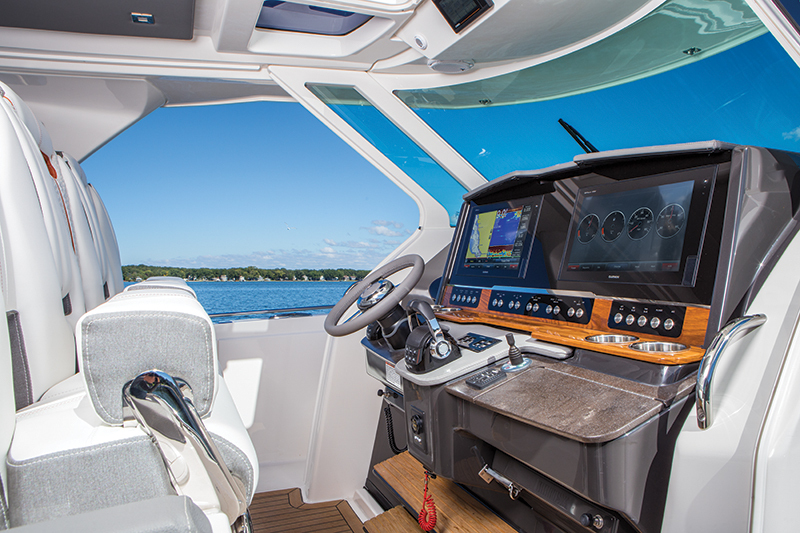 A pair of 16-inch Garmin GPSmap XSV multifunction displays, part of the Tiara Sport Glass Cockpit, are flush with the dash surface and deliver all the information a captain or an editor on a sea trial might need. The Yamahas have their own display, but all their info can be routed to the MFDs for handy viewing. Flanked on the right by the engine throttles and on the left by the Helm Master joystick, the centerline steering wheel anchors a lower dash that includes cupholders, a bow thruster joystick, trim tab controls, a glove compartment and more. Facing the helm are three captain’s chairs that use the forward half of the galley console as their base. Flip-up bolsters on each chair give the occupants their own choice whether to sit or stand. Twin footrests, one high and one low, provide comfort underway. A full windshield provides protection from the wind, though it only wraps a short way around the corners, so helm occupants can enjoy the breeze that comes around the sides without being hit in the face by it at nearly 60 mph. Overhead, a hardtop runs from just forward of the helm to just aft of the galley console, leaving the occupants of the rotating settee in the sun. But a very quiet sun shade extends out of the hardtop to provide settee occupants with shade when it is desired. 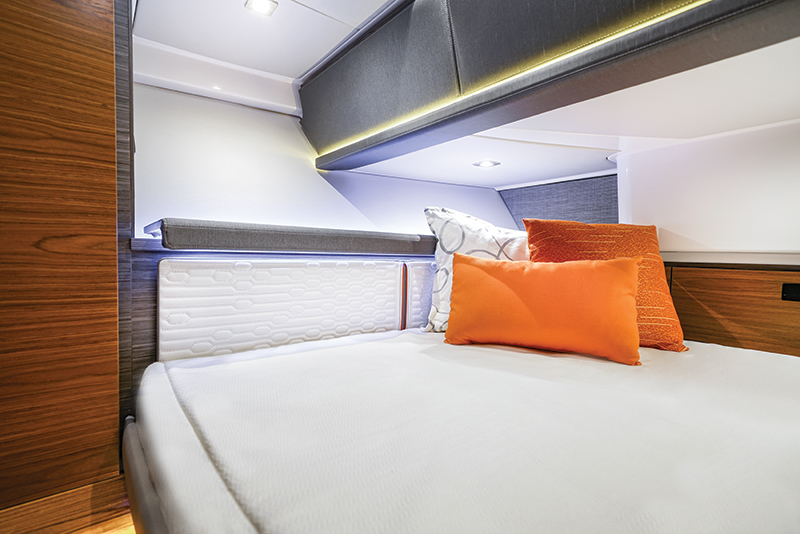 Belowdecks, accessed through a sliding door forward of the portside helm chair, is outfitted with a head with a Corian vanity top and a shower curtain, a hanging locker and a berth built for two, not quite queen size. It’s the kind of space a couple can enjoy for a long weekend on the hook somewhere pleasant. 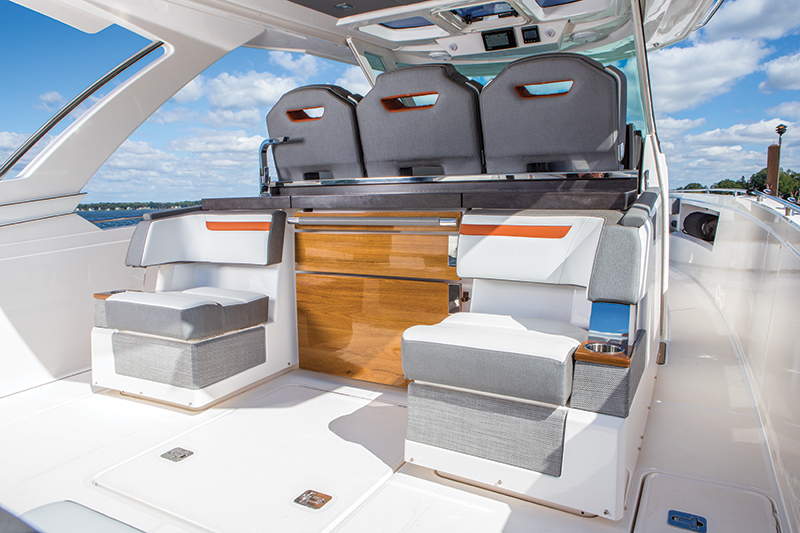 The combination of a center console design and a dayboat sensibility creates a boat that can accommodate 15 people for a day on the water and facilitate ease of movement fore and aft. And passengers shouldn’t get tired of sitting. The upholstery is quilted along the backrests and soft where rear ends occupy. Pops of color and large contrasting stitching create visual interest from bow to stern, and teak on the swim platform, footrests, steps and the deck provides a yacht-like feel. With Tiara now divested of the Pursuit brand, its outboard efforts will be focused on the Sport line, so expect it to grow quickly — though maybe not 58 mph quick. LOA: 38 ft., 1 in. Triple Yamaha F300 outboards, Tiara Sport Glass Cockpit package (Garmin GPSmap display, transducer, Yamaha CL7 Command Link Plus display), head compartment w/ shower stall, forward berth, premium stereo system (Fusion and JL Audio) and more. Triple Yamaha F350 outboards, Yamaha Helm Master steering system, Lenco Auto Glide trim tabs, Seakeeper gyro, water heater, underwater lights, teak on swim platform, second Garmin GPS map display and more.